Cecilia Bowens, Kerry Duvall, and Lacey Utz were the 2019 recipients of the Phenomenal Woman awards. (Photo courtesy of Lana Williamson). On Wednesday, March 27, the third annual Phenomenal Woman Awards Banquet was held to celebrate the accomplishments of women at the College. Over 25 female students, faculty, and staff were nominated for awards by friends, classmates, students, and professors. 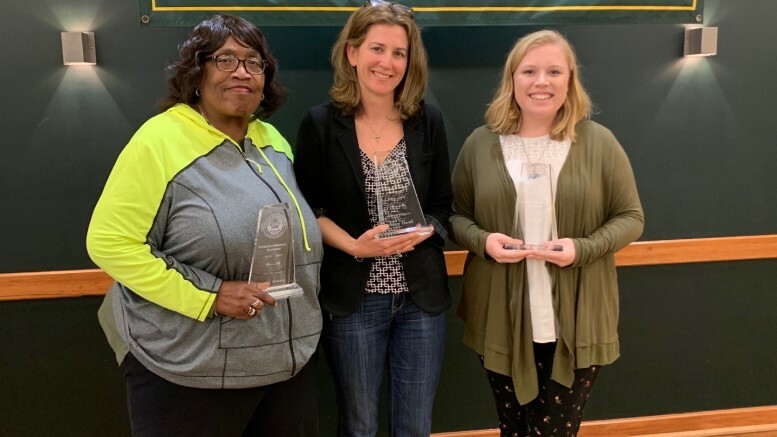 Cecilia Bowens, who most community members have met on their way into the dining hall, won the staff award; Kerry Duvall, assistant professor of economics and business administration, won the faculty award; and Lacey Utz, a senior psychology major, won the student award. The celebration was organized by Phenomenal Woman, a student organization founded “to create a sense of unity amongst women so that [they] can come together in unity to help one another strive in life,” according to their profile on Orgsync. Their events and meetings focus on empowering and supporting all women and giving them a safe and welcoming atmosphere. The event began with a welcome address by Jose Moreno, the director of the Office of Diversity and Inclusion. Also featured was a reading of the poem “Phenomenal Woman” by Maya Angelo, after which the club was named. Each line of the poem was read by a different member of the club from around the room. A keynote address was given by Tirrany Thurmond, the director for the Center for Student Diversity at Mount St. Mary’s University. The theme of this year’s banquet was “Breaking the Glass Ceiling,” aiming to show how women can overcome the limitations that are seemingly put over them by society.